This black beans recipe is simplified and easy to follow. Black beans are quite simply the most gorgeous food on the planet. Our family eats black beans at least twice per week. Black beans have a stunning, natural, meaty flavor. When my daughter wants a snack, I'll make up a batch of black beans and she eats them alone. Since beans are so loaded with nutrition, she gets no argument from me. My daughter actually prefers black beans to pinto or Peruvian beans. Black beans are delicious with fish, as a side dish for chicken, or even alone. It took me five or six tries before I learned to make them correctly. They are a bit tricky to make, so I'll give you all of the tricks of the trade so you can avoid any problems. Black beans are loaded with nutrition. These lovely black diamonds contain polyphenols and are loaded with heart protective plant compounds. Beans stabilize blood sugar and contain soluble fiber, iron, lysine, cysteine, tryptophan and methionine. 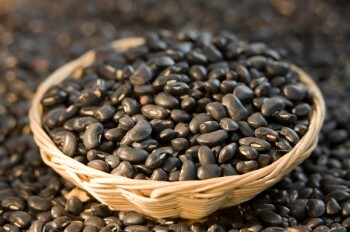 Black beans nutrition includes folate, complex carbohydrates, flavonoids, isoflavones and antioxidants. Beans have the highest protein content of any vegetable. Beans are an essential superfood. Black beans can be stored in a cool, dry place. You can freeze them in their raw form for up to six months. You can also cook them first, put them in individual-sized containers, and freeze them for later use. When cooking black beans, they should be pre-soaked. 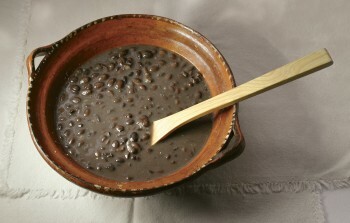 Black beans do not require soaking, but if you do not soak your beans, they can take up to an hour and a half to cook. There are two ways to soak beans. You can do a quick soak where you boil the beans for a few minutes, then turn it off and let it sit for an hour. Then of course there's the long soaking method. The long soaking method is always the best. If you soak your black beans, the same deep purplish/black water should be poured out to remove the antinutrients. Check out our Chipotle style burrito bowl recipe made in our own home. This low glycemic burrito bowl recipe features black beans, and it makes this a unique home-made dish. 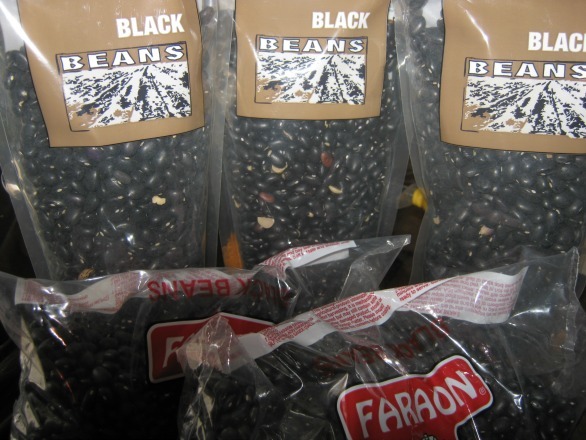 The black beans recipe below will make six cups of beans. If your family is small, you can cut the ingredients in half. This recipe is so delicious, it's even better than any restaurant. In a strainer or a bowl, examine your black beans for broken beans. The broken beans may appear white. That means that the inside of the beans are exposed. You want to remove those because you want to give your finished beans a uniform look. Also, be sure to remove any rocks or pebbles. Completely cover the beans with water in a bowl and let them sit for four to six hours, or even overnight. . When your beans are done soaking, they will double in size and the water will look like black or purple ink. Once they're done soaking, pour the dark colored liquid out. This soaking process eliminates gas producing compounds in black beans. Take the pre-soaked beans, bay or avocado leaves, cumin, olive oil, sea salt and 1/2 onion, ground garlic and put them in a large pot. Turn the heat on the lowest setting. Make sure the beans are fully covered with the nine cups of water. Add more fresh water if the level is low. Cumin is The Secret Weapon: One word about cumin. It is the secret ingredient in any black beans recipe. Cumin has an earthy smell, and gives the beans a rich texture and taste. If you like, you can add more or less cumin according to your tastes. Boil your black beans with all of the ingredients on the lowest setting possible. All beans need to be cooked on a very low heat. That's another trick of the bean-cooking trade. When your beans are cooking on the stove, you definitely want to cover them. A trick I always use when cooking any kind of beans is to cover them, but to leave a little tiny space open on the lid. This allows steam to escape. Also, when you are cooking black beans, if you notice suds on the top, you can remove them with a spoon. Tip: You can cook black beans in a pressure cooker for about 30 minutes to shorten the cooking time. Once the beans are done, you can remove the half an onion. But since onions are a superfood, you can also leave them in. If you are brave and you want to experiment, you can add chipotle mora chiles to your black beans for a truly authentic Mexican taste. When you are cooking your black beans recipe on the stovetop, after about 30 or 40 minutes, you need to keep checking them. If they are soaked, they cook quickly. 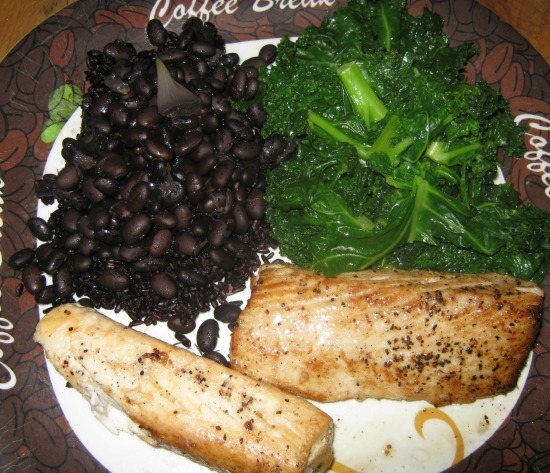 The picture below is wild caught Mahi-Mahi, kale, black rice and black beans. This meal is rich in antioxidants, high quality protein, and is highly recommended for our hair loss diet visitors. 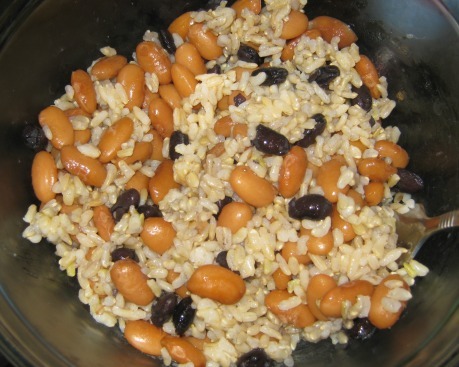 The picture below is black beans mixed with Peruvian beans and brown rice. We like to top this with cheese for an incredible snack. Click here to learn how to cook brown rice. Your black beans recipe can take anywhere from 45 minutes to 1-1/2 hours to cook. This is not true of Peruvian or Peruano beans, which take much longer. When they are done, they will have a tender texture. For a rich snack, try black beans mixed with black rice topped with cheese. Once you cook your own black beans recipe, you will never look at canned beans in quite the same way again. Learn step by step how to cook Peruvian beans. They are fantastically delicious, and compliment this black beans recipe! Watch the video below! 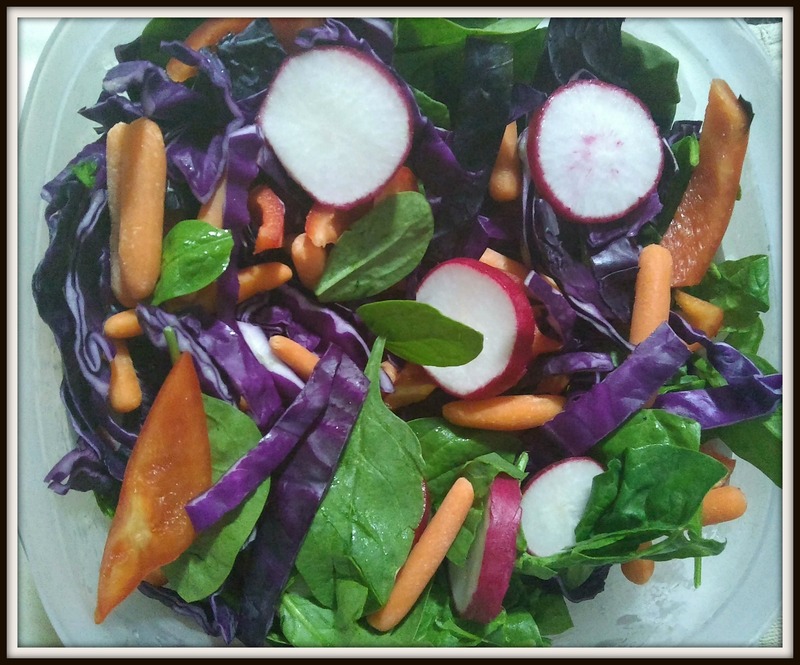 Look at this delicious home-made vegetable salad below. Learn how to put your salads to fit our healthy diet guidelines. Click the picture below to learn more!